When I was on study abroad several years ago, my roommates and I frequented a handful of restaurants semi-regularly, one of which was a creperie in Dublin’s city center. Like many that cater to the brunch crowd, this was an order at the counter establishment, and all the cooking was done just to the right of the till, behind the counter. I remember watching each time as the cook spread buckwheat or regular batter across the big crepe pan, let it sizzle, flipped, and then added toppings. Ever the one to favor vegetables, I often reverted to the menu options that leaned heavily towards spinach and mushrooms. 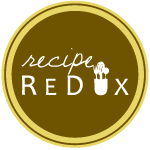 Like in years past, The Recipe Redux challenged us to Grab a Book and Cook this month and because I wouldn’t want to break from tradition too terribly much, I reached for my newest Green Kitchen Stories cookbook and found a recipe on page 127 I’ve been tweaking for quite some time. I had even transferred my version to a word document, dated last from July. Of course it was a quick and savory green crepe recipe, leaning heavily on spinach and mushrooms. Apparently my preferred crepe flavors have changed remarkably little in all these years. David and Luise use rice flour and eggs in their crepes, and then they dress them up with an extra step of tahini, apple, and garbanzo salad. I never did favor that particular combination, the extra step involved, or the heavy egg flavor that came through, as I’m often particular about how and when I’ll take my eggs. Instead, I tweaked the recipe over time to include buckwheat, garbanzo or garbanzo/fava flour for extra protein without another topping, and aquafaba as an egg alternative. Being quick and easy, these are weeknight friendly and the batter will keep for a couple days in the fridge if needed. As an extra note for those who have allergy/intolerance restrictions or prefer to avoid purchasing unnecessary ingredients, I realized a few months back that my favored buckwheat flour was no longer being milled in a gluten-free facility. I tend to opt for metrics when working with flours anyway, and if you do too and have a semi well-stocked pantry and a coffee grinder, unroasted buckwheat groats (not kasha) will grind into a fine flour as quick as can be and doing so mostly skips the gluten-contamination issue. I also tend to keep leftover aquafaba (chickpea cooking water) in the freezer for occasions that call for quick crepe meals like this one, but if you’re partial to eggs and/or have flax or chia, those options work as well. Place the crepe ingredients in a large mixing bowl and blend, using a hand (immersion) blender, until smooth and green. Alternatively, mix the batter ingredients together in a blender. Refrigerate for about 30 minutes while you prep and cook the mushrooms. For the mushrooms, heat a large sauté pan over medium-high heat. Add coconut oil, garlic, sliced mushrooms, thyme, and a couple pinches of salt and pepper. Cook until the mushrooms are soft and glistening, about 8-10 minutes, stirring occasionally. Remove from heat and set aside while cooking the crepes. To cook the crepes, heat an 8 inch (20 cm) sauté pan over medium heat. Add a pinch of oil and when it is melted, about 1/3 cup (80 ml) of the crepe batter. Tilt the pan until the batter is evenly distributed. Cook for 2-3 minutes per side, until each crepe is golden and can be turned easily. Repeat with the remaining batter until all the crepes are cooked. There will be about 12 in total. Place the finished crepes on a plate in the oven on the lowest setting while cooking the remaining batter. To serve, top each crepe with yogurt, if desired, and mushrooms. Feel free to add a small handful of additional spinach and/or some toasted sunflower seeds alongside to round out the meal.